Ronseal Decking Rescue Paint gives old decking a new lease of life. It fills small cracks, seals down splinters and covers grey wood, making decking look as good as new. Decking Rescue provides a long-lasting and scuff resistant finish. Coverage: With 2 coats a 2.5 Litre tub will cover approximately 10m on ridged boards, and 12m on smooth planed boards. 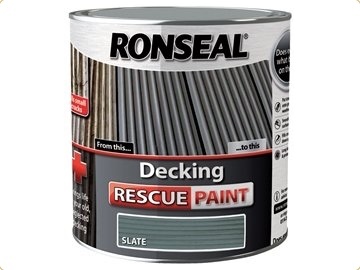 This Ronseal Decking Rescue Paint has the following specification: Colour: Slate.Size: 5 Litre.